Last week I covered the names of Jane Austen's heroines. Now we will look at her captivating heroes. The male characters of her novels have a variety of alluring characteristics, making some more attractive than others. Captain Wentworth and Mr. Darcy are often the favorites, and their last names might be a favorable alternative to their first, especially in Fitzwilliam's case. In any case, as with her heroines, Miss Austen's heroes are the perfect group of classic names that will stand the test of time. Edmund (Bertrum) - Mansfield Park is probably my least favorite novel by Miss Austen. I'm not sure if that has an influence on my feelings about the names of the main characters of the book or vice versa. ;) But Edmund is a strong name and one that should be used more than it is. Edward (Ferrars) - Edward is my least favorite leading male character (Sense and Sensibility), but he is respectable and the name is a true classic with several nicknames to choose from: Ed, Eddie, Ned, Ted, Teddy, Ward. Fitzwilliam (Darcy) - Ahhhh, Darcy. The hero of Pride and Prejudice. His last name is great, especially as a girl's name. Fitzwilliam could be too much for a boy to carry off today, but parents could always go with William if they want to honor this distinguished character. Frederick (Wentworth) - Captain Wentworth is definitely the most swoon-worthy of the heroes. The letter he wrote to Anne in Persuasion is by far the most romantic thing ever written. "You pierce my soul." What girl wouldn't want to hear that? As I've written before, Wentworth is an enchanting first name candidate, and Frederick is a sound choice as well. Freddy is an adorable nickname. George (Knightley) - Mr. Knightley knew how to put Emma in her place, and he's one of my favorites for being so adept. I personally love the name George and it's steady in the rankings. Not to put a damper on it though, George was also the first name of Mr. Wickham in P&P. Henry (Tilney) - Mr. Tilney doesn't stick out as a romantic hero in Northanger Abbey, but he has wonderful humor and personality. The name Henry is slowly rising the charts as it should. Miss Austen again puts a great first name on a hero as well as a less-than-stellar character: Henry was also the first name of Mr. Crawford in MP. 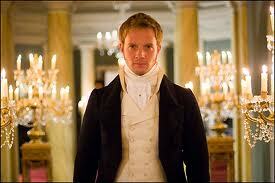 Charles - Bingley, Jane's love interest in P&P; Musgrove, Anne's brother-in-law in Persuasion. Christopher - Brandon, Marianne's suitor in S&S. Frank - Churchill, possible love interest for Emma in Emma. James - Morland, Catherine's brother in NA; and Benwick, possible love interest for Anne in Persuasion. John - Willoughby, Marianne's love interest and Dashwood, Elinor and Marianne's half-brother in S&S; Thorpe, Isabella's brother in NA. NOTE: Willoughby has also been seen often throughout the years as a given name. Philip - Elton, rejected by Emma in Emma. Robert - Ferrars, Edward's brother in S&S. Tom - Bertram, Edmund's brother in MP. Walter - Elliot, Anne's father in Persuasion. William - Collins, rejected by Elizabeth in P&P. I personally prefer the last names of some of these gentlemen - Knightley, Churchill, Willoughby, Elliot, Collins and Elton are all great options!